Come on down by the River! 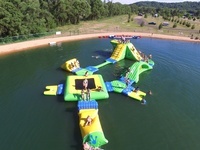 Located on the beautiful Lower Wisconsin State Riverway, Wisconsin Riverside Resort offers RV and tent camping, cabins, swim pool & splash pad, canoe, tube and kayak trips on the Wisconsin River. NEW in 2017, Liza's Lagoon - a swimming pond complete with slide, trampoline, and other fun inflatables. Also enjoy a variety of entertainment at the beautiful restaurant and bar, complete with a large banquet hall overlooks the Wisconsin River that creates the perfect backdrop for your wedding or special event.